Designed for both indoor and outdoor versatility, the Evenflo Versatile Play Space offers over 18.5 square feet of safe, enclosed fun! Exclusive reversible legs have outdoor stakes for lawn stability and anti-movement/non-scratch floor pads for any interior floor surface. It's quick and easy setup and folds with a unique hinge design: simply unfold and connect together the six interlocking UV- and weather-resistant panels. 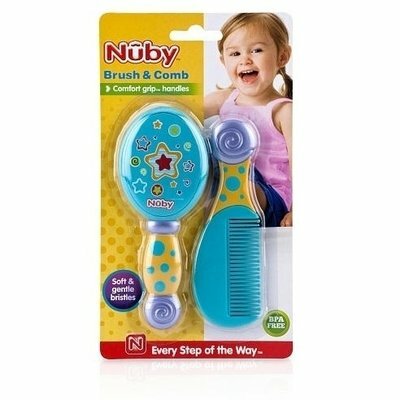 Smooth edges and a moulded handle make it easy to take anywhere for safety on the go. No tools required! 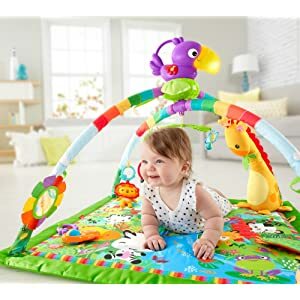 Little Tikes Soothe ' n Spin Activity Gym addresses baby's specific developmental needs through every coo, giggle, and stretch. 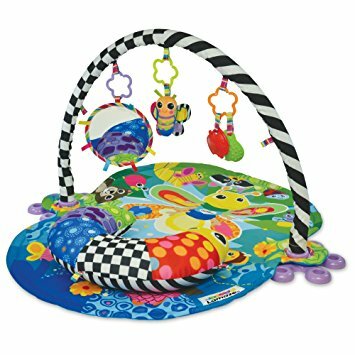 This adorable play mat helps build core strength as your baby watches and tries to touch the spinning crabs as it turns and plays music. Its compact size also makes it perfect for on-the-go fun. The wind up crabbie spins and soothes, ideal for when baby needs to wind down before a nap. 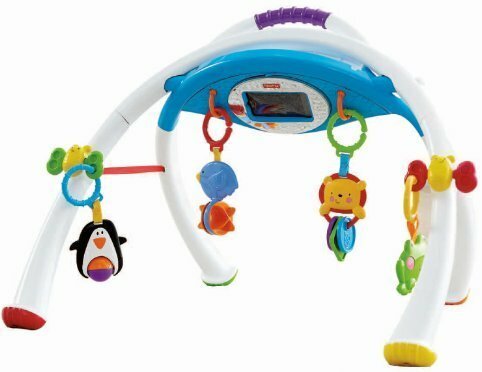 When baby wakes up and is ready to play, there are 3 stimulating hanging toys that will delight them. 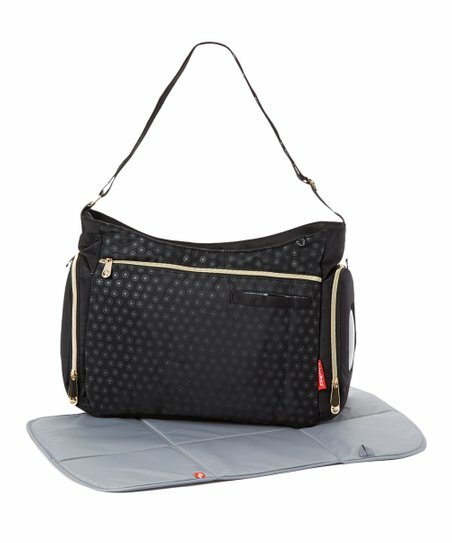 When it's time to go out, this handy gym folds up compactly and can even fit in a large diaper bag for on-the-go. a beautifully crafted luxury playmat designed to support and entertain your baby thorugh three stages! 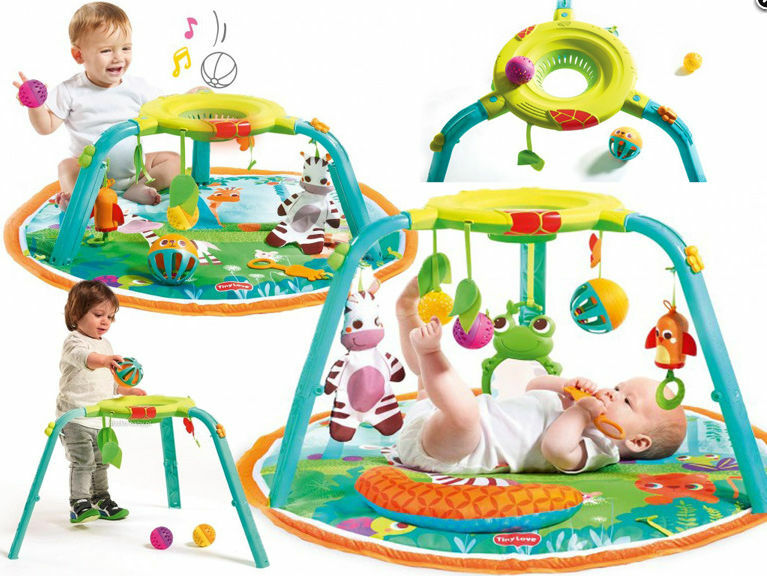 There are three fun ways for your baby to explore Lamaze’s Freddie Firefly Gym. With brightly coloured pictures and patterns to encourage sensory discovery, baby will love to kick around lying on the mat. 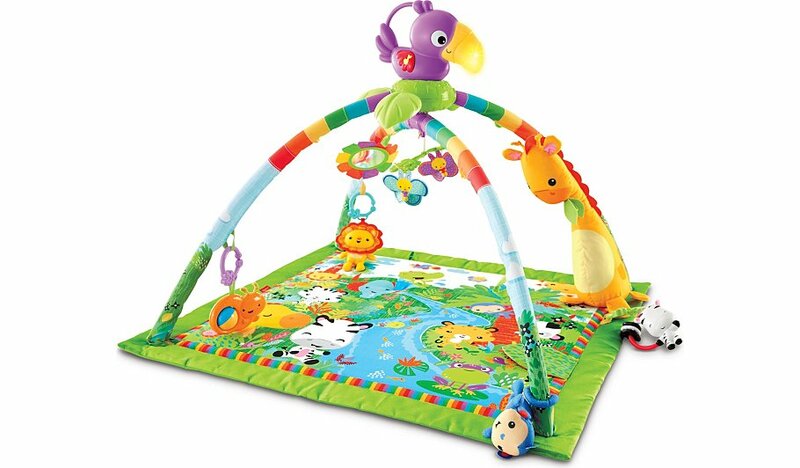 Baby can reach for the three detachable toys that are featured on the arch, strengthening baby’s eyes. 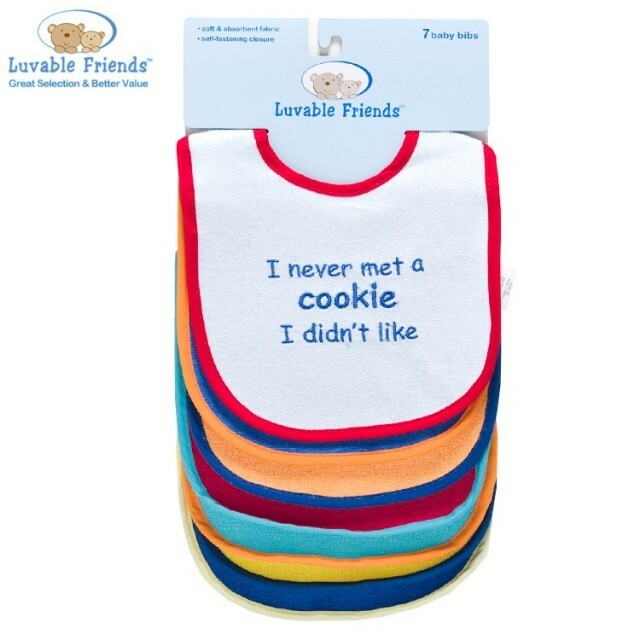 Brightly coloured pictures and patterns to capture baby’s attention. 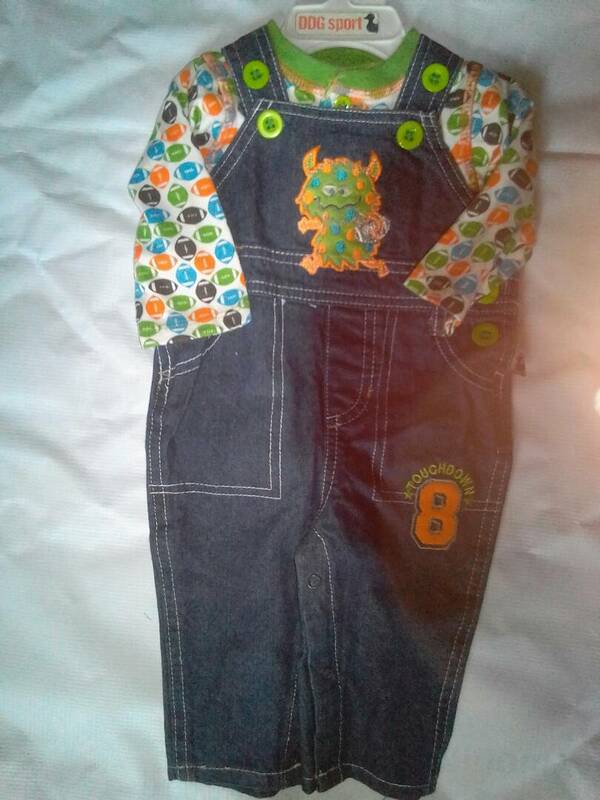 Freddie the Firefly’s symmetrical happy face and crinkly wings will capture baby’s attention. Play peekaboo with the large discovery mirror promoting baby’s recognition of themselves and you. 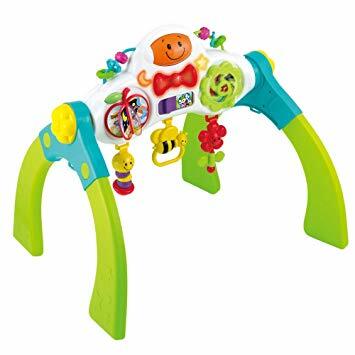 The soft apple teether is perfect for teething babies. 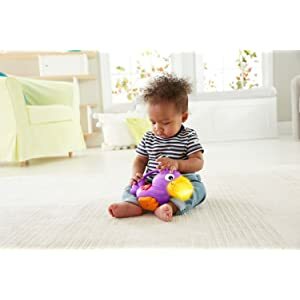 The comfy 2-in-1 pillow will help to support your little one during tummy time, and when baby begins to sit, the comfortable padded mat provides a soft surface to play. 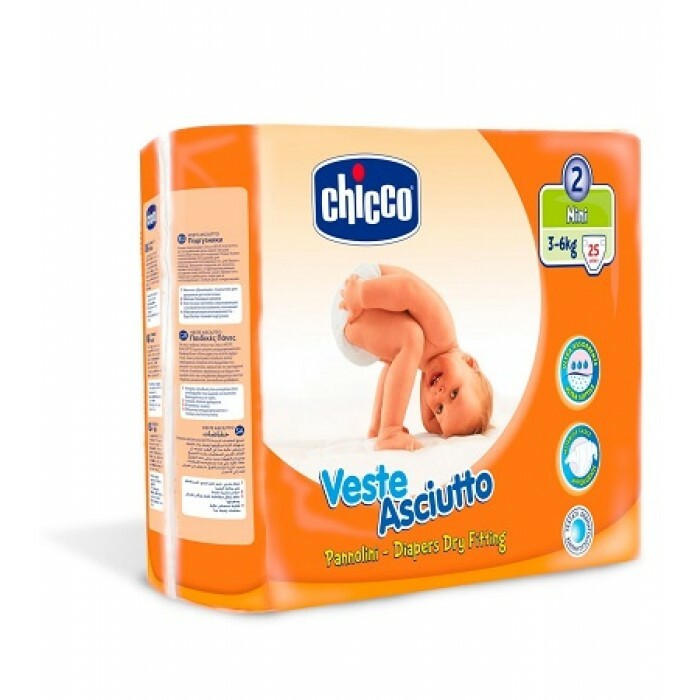 Suitable from birth onwards. 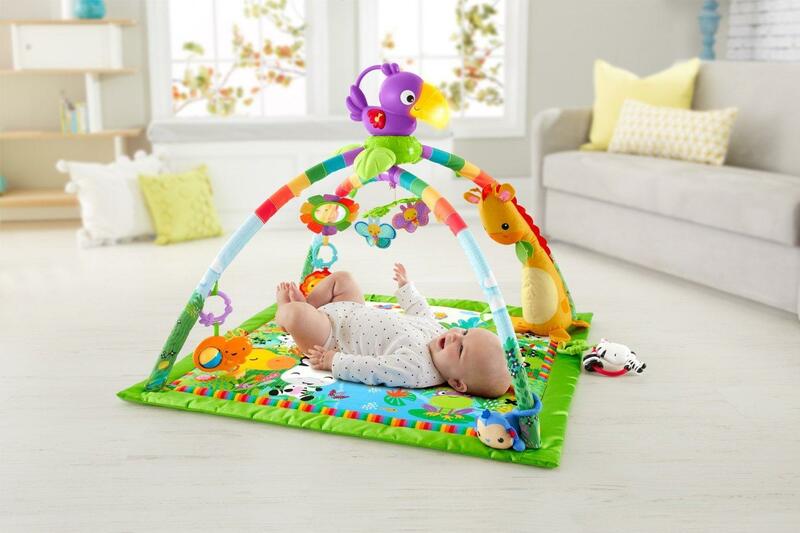 The most loved baby gym now has 3 modes: lay and play, tummy time, and take-along. The Giraffe detaches and is destined to become babies best friend on the go and the Toucan can be removed for nighttime lullabies. 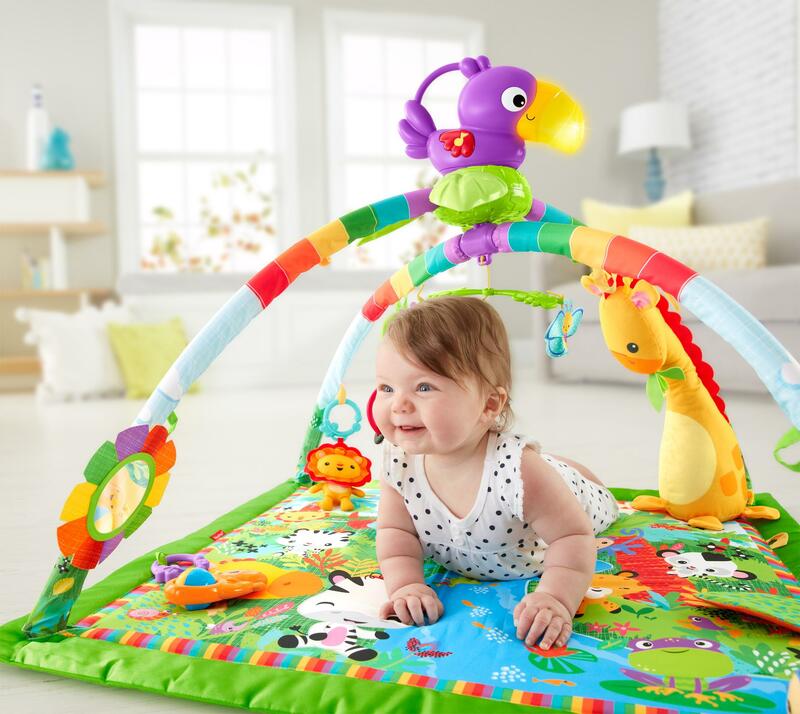 An updated mat provides for a more engaging tummy time with so much for baby to explore. The soft satin borders, crinkle leaf, and side ribbons will stimulate babies senses and imagination. This Baby Gym Comes With Its Own Personal Trainers. 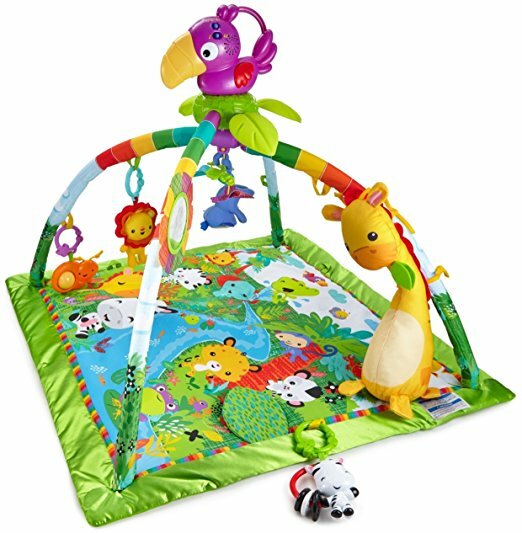 With more than 10 toys and activities – and music, sounds and lights that are activated by your baby’s kicks and movements – your little one will get quite a workout at the Rainforest Music and Lights Deluxe Gym! Baby can bat at the soft lion and monkey. Spin the snail’s rollerball. Make the zebra clack. Check out that good-looking kid in the mirror. And when baby gets bored with the same-old, same-old, rearrange the linkable activity toys to provide a whole new point of view! 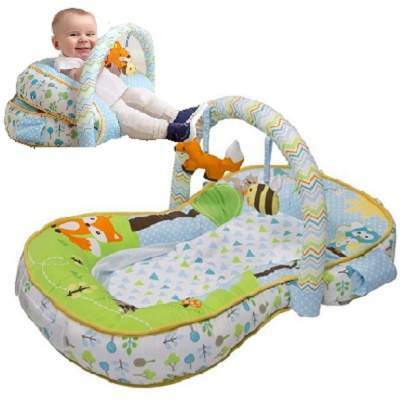 The soft mat lets baby settle in for hours of sensory stimulation in this wildly fun rainforest. Three ways to play: Lay and play, tummy time and take-along. Responds to baby's movement with music and lights in short-play mode. 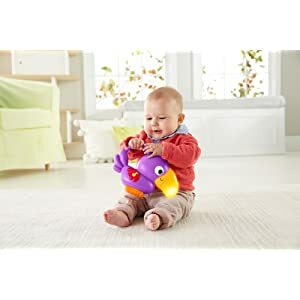 Removable, take-along toucan - press its wing or give it a gentle shake to activate tunes & lights. Lay and Play and Tummy Time Can Get A Little Wild! 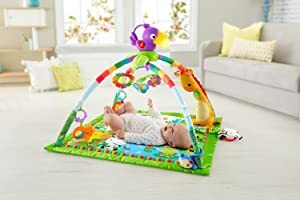 This newborn gym 'grows' with baby, entertaining your teeny-tiny one during lay and play time – and encouraging older babies to push up and play during the all-important tummy time. 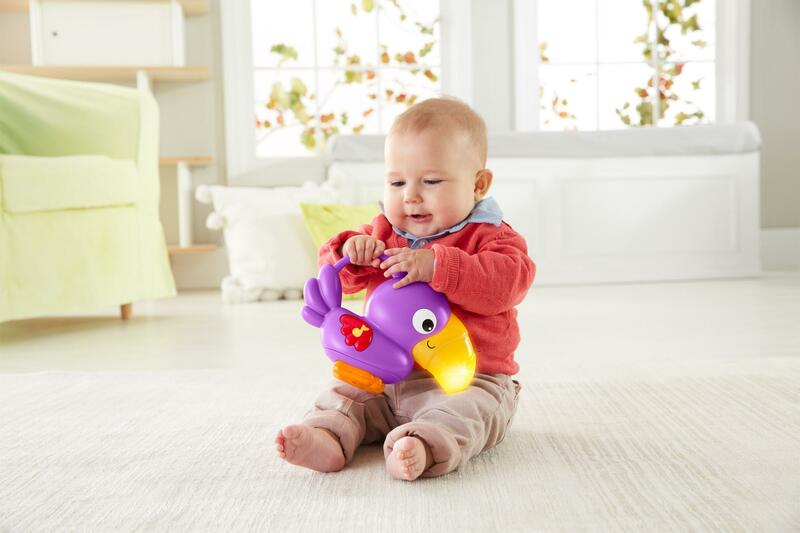 The light-up musical toucan offers hands-on fun, too! Remove it and then just press the toucan’s wing or give it a gentle shake to be rewarded with fun tunes and lights. And it’s removable, so you can take it with you when you and baby are on the go-go-go! 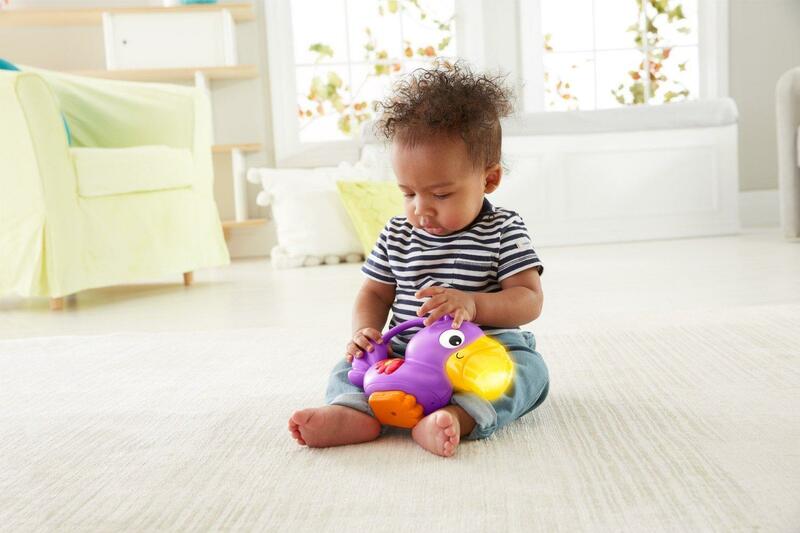 Baby (And You) Will Be Mesmerized By All Of The Busy, Skill-Building Play! As baby plays, new discoveries are made and key developmental skills get stronger and stronger. By batting or kicking to trigger music, sounds and lights, baby is discovering how to make things happen – a great introduction to cause and effect! 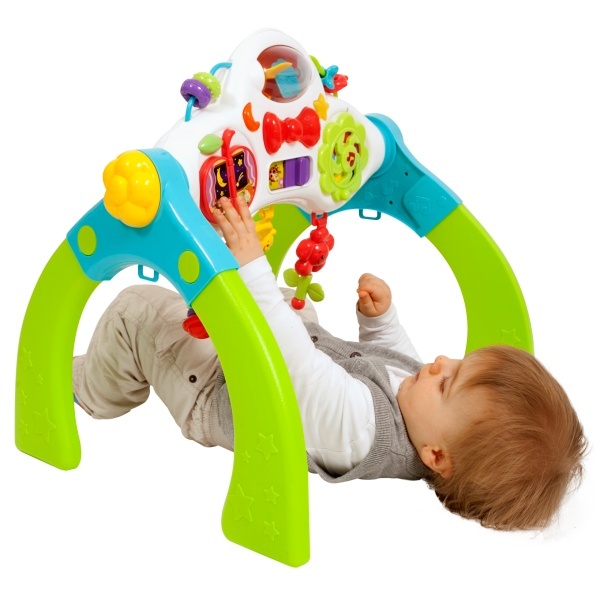 The toys all around encourage batting, kicking and tummy time play, helping to build upper body strength. 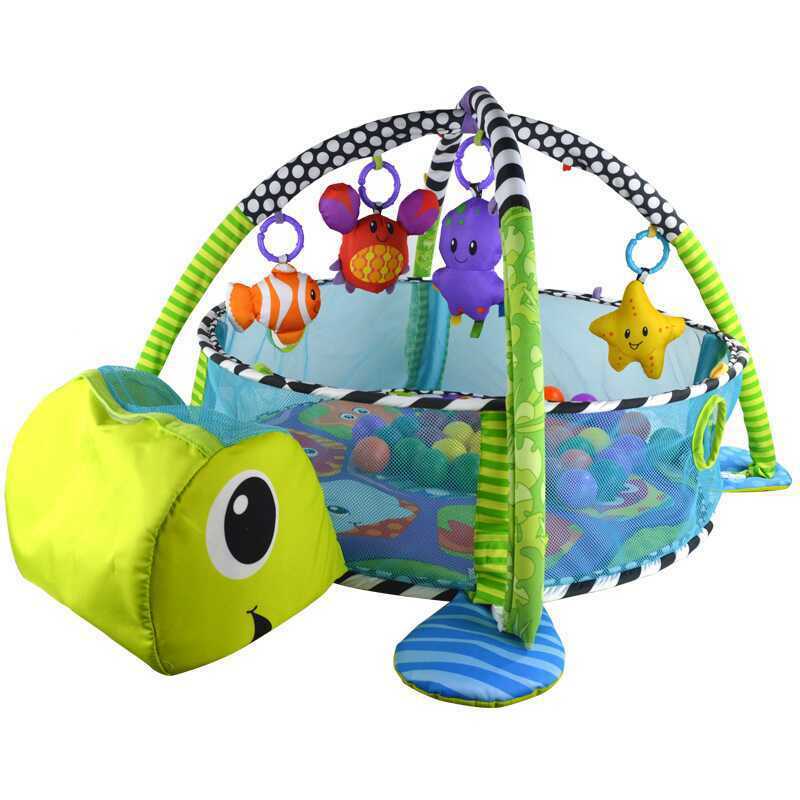 Bright colors and high contrast details help enhance visual skills, while music, sounds and textures help stimulate baby’s senses of hearing and touch. 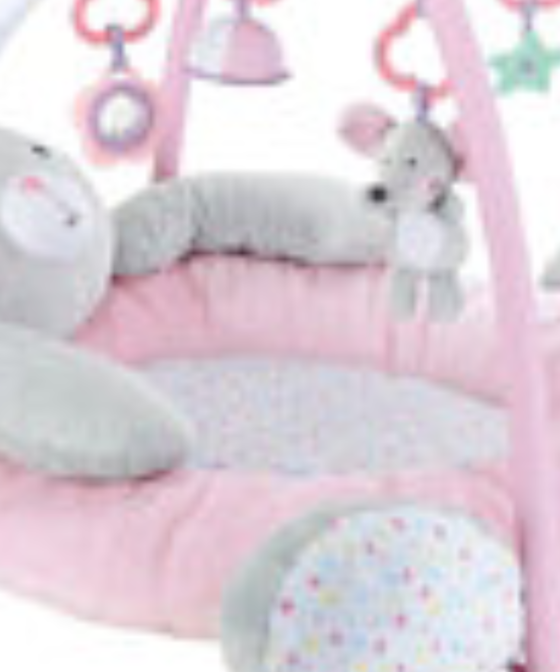 Mode 1: From Birth, Lying and Tummy-Time - A tummy-time pillow is included and a wide selection of stimulating toys that help extend tummy-time. 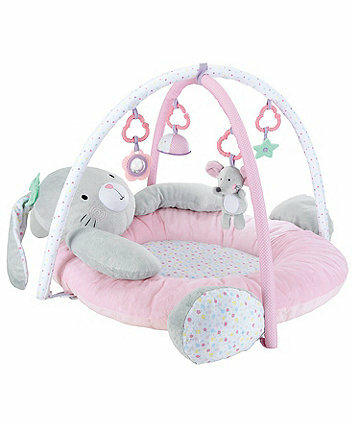 Let baby enjoy the product's soft lights & music feature or play with the bird wind-chime and rattling balls for fun and amusement. 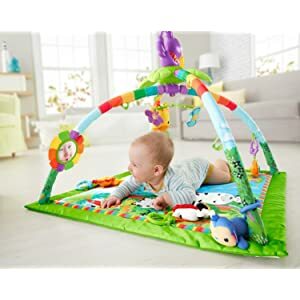 Place baby on the soft tummy-time pillow in front of the mirror to encourage tummy-time, engagement and strengthen neck and shoulder muscles and development of gross motor skills while on the mat. 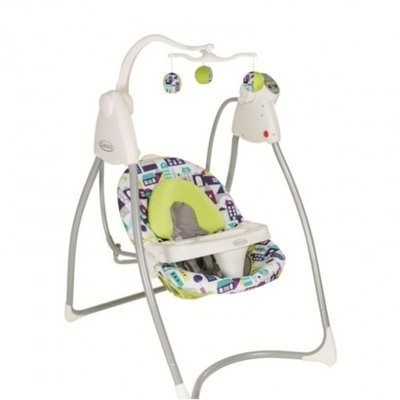 Mode 2: 6 Months Plus, Sitting Up - Once baby is sitting up, move the product into the activity centre mode by folding it to transform into an activity centre that includes a fun ball game with musical feedback that encourages fine motor skills, cause and effect and strengthens the sitting position. Mode 3: 10 Months Plus, Standing Up - When baby is standing, raise the product to its full height and let your grown baby explore and learn through play, developing her understanding of cause and effect with the help of the Gymini's fun sliding spiral ball game, encouraging baby's cognitive growth through learning about cause and effect. 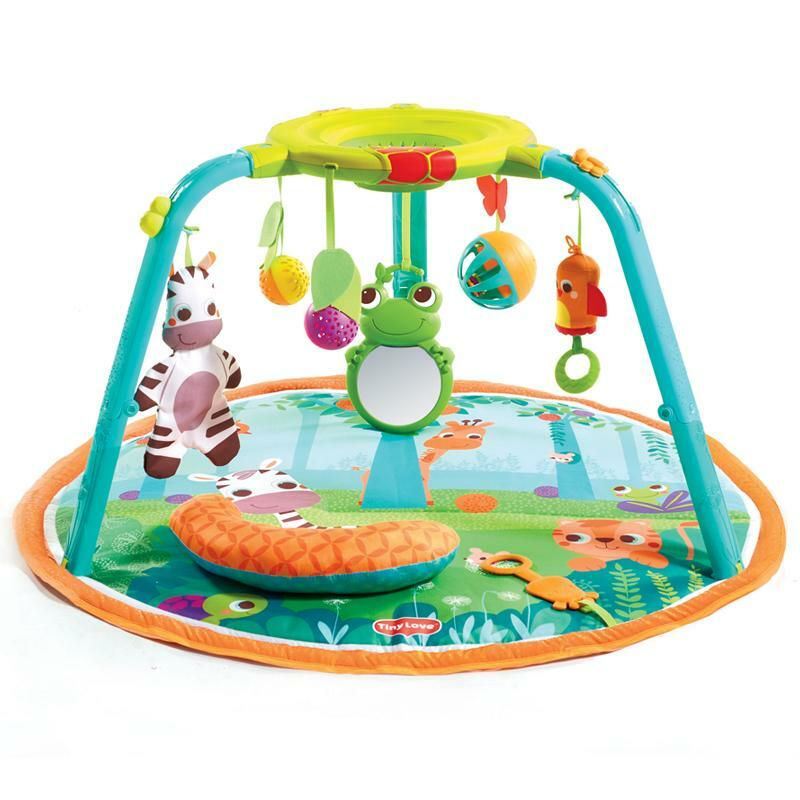 The gymini includes 15 fun activities and features including a musical electronic ball game, bird wind chime, tiger ball with rings, frog mirror and more. The innovative electronic ball game includes 2 modes of music, interactive lights & music feedback and a sliding spiral for small balls. 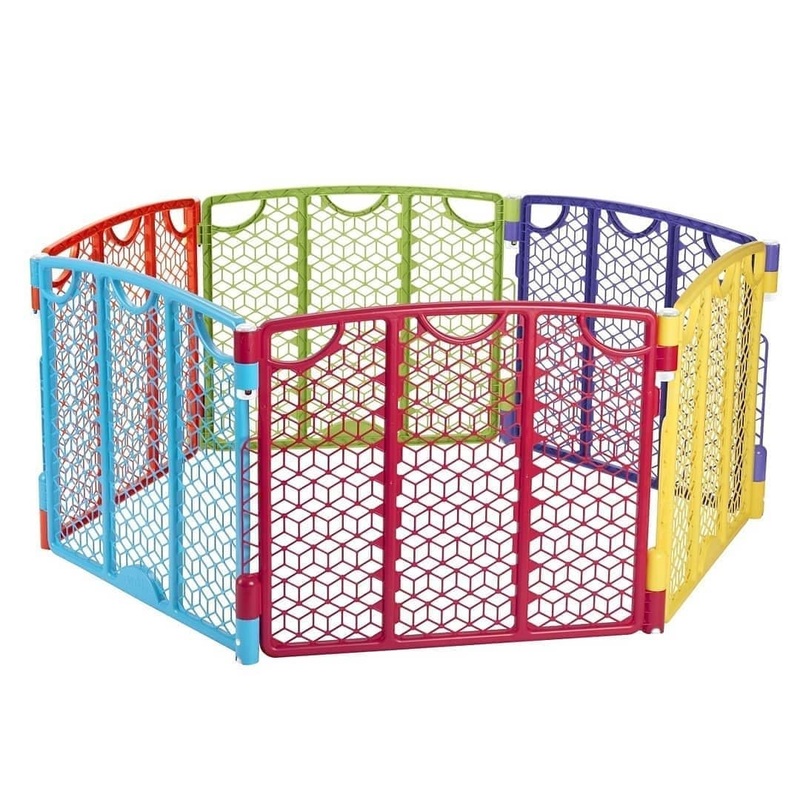 This Baby Playpen for kids has 14 panels.The material is safe and non-toxic, you can rest assured to use. In addition, you may assemble this panels as different form. The swinging hinged door is equipped with a safety lock to keep the kids in. The size and shape of playpen is adjustable by adding or removing panels or by placing panel in different shape. It also may create interest and encourage mobility for your child. Makes a great holiday gift. The North States Superyard Colorplay Ultimate is an excellent solution for creating a safe play area for your child, both indoors or outdoors. It features a quick access door that opens easily with one hand. The brightly-colored, yard encloses up to 18.5 square feet (over 5 feet across) and is 26 inches high. 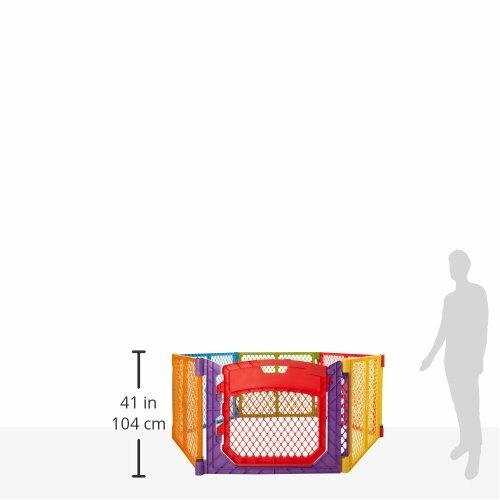 Want to increase the size of the play area? A Two-Panel Extension is available separately. Did you know that babies develop their color vision around 4 months? This is just in time for introducing the Colorplay Ultimate. 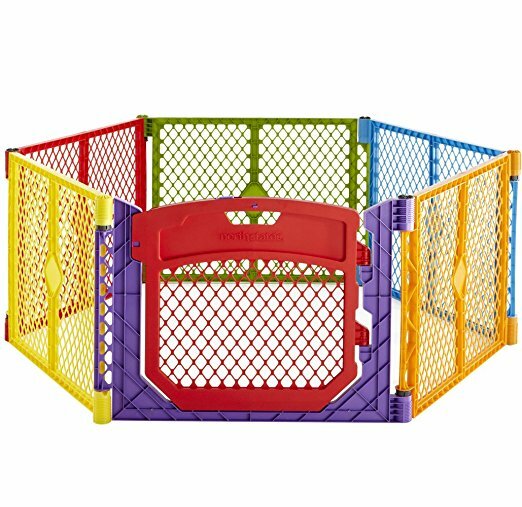 The bright primary colors of this play yard will continue to stimulate your child’s vision development as well as make playtime fun. Setting up the Colorplay Ultimate is easy, the six interlocking panels are pre-connected -- simply pull the panels out of the box, unfold and connect them together. The Colorplay Ultimate includes a convenient carry handle which makes this lightweight yard easy to take anywhere. When using indoors, the included skid-resistant pads keep the yard from slipping or scratching floor surfaces. Intended for use with children 6 to 24 months of age. We are proud to manufacture the Colorplay Ultimate and the vast majority of our gates and play yards in the U.S.A.
One pre-assembled Colorplay Ultimate play yard, twelve skid-resistant pads, one carrying strap, and an instruction manual. 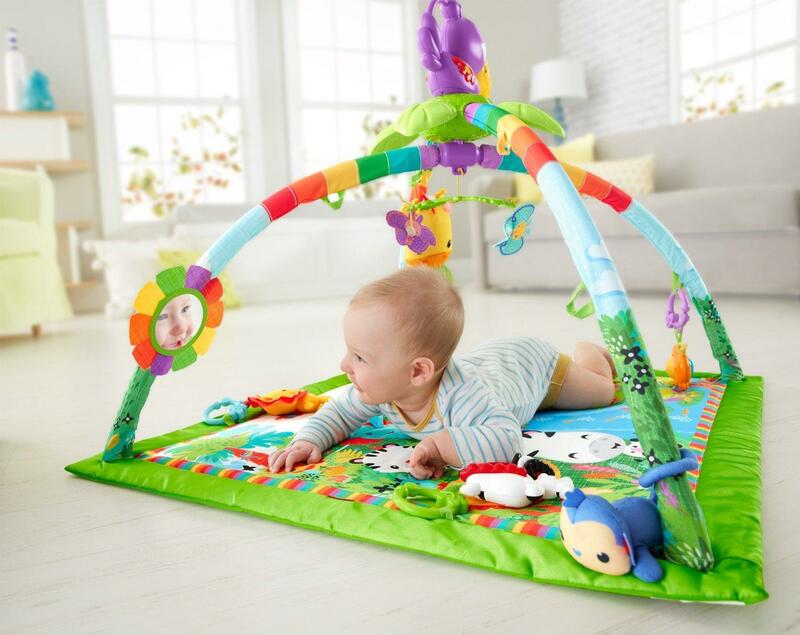 The Colorplay Ultimate creates a safe play area for your child virtually anywhere. Set the Colorplay up outdoors for a safe, fun place to play. The weather-resistant panels are easy to clean with mild soap and water. Want to use it indoors – no problem. The Colorplay Ultimate can be used on any surface in your home including: carpet, tile, hardwood floors, etc. The skid-resistant pads will prevent the panels from scratching and slipping. Weighing only 20 pounds, the lightweight panels fold up easily so that you can take the Colorplay Ultimate with you anywhere. Simply fold the panels in alternating directions and slip one end of the carrying strap through the mesh of each outside panel. Once you snap the strap closed, you’re ready to go. The yard panels fit together like a puzzle, simply lift up on one panel while pressing down on the other. The pin on either end of the panel sits perfectly in the plunger for a secure fit. The access door is easy to operate. To open the door, slide and keep holding the top latch in a pulled-back position. Lift the door up and over the threshold, then open out. Simply reverse this motion to close. The door includes a lock for additional security. A Colorplay Two-Panel Extension allows you to increase the Colorplay Ultimate from a 6-panel to an 8-panel play yard. Sold separately from the Colorplay Ultimate, the additional two panels increase the size of the yard from 18.5 square feet to 34.4 square feet ~ that’s almost 7 feet across! Here at North States we’ve been making homes safer for children and pets since 1953. Our mission is to create and produce innovative, superior quality products designed to provide the highest standards for safety, durability, and ease of use. We are proud to offer the largest assortment of gates and play yards, all come with a limited full-year warranty and are certified by the Juvenile Products Manufacturers Association (JPMA). What Is The Fisher-Price Apptivity Gym? Everywhere baby looks, there’s a new adventure to explore. 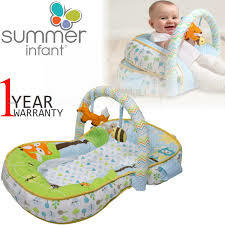 Baby will have plenty of fun batting at the overhead toys to change the content on mom’s iPhone or iPod touch, through the downloadable apps. There’s even a built-in peek-a-boo mirror and four linkable toys. The Apptivity Gym’s rubberized feet provide added stability, and it folds completely flat for easy storage and portability. Securely lock your iPhone or iPod touch into the gym, and let playtime begin!